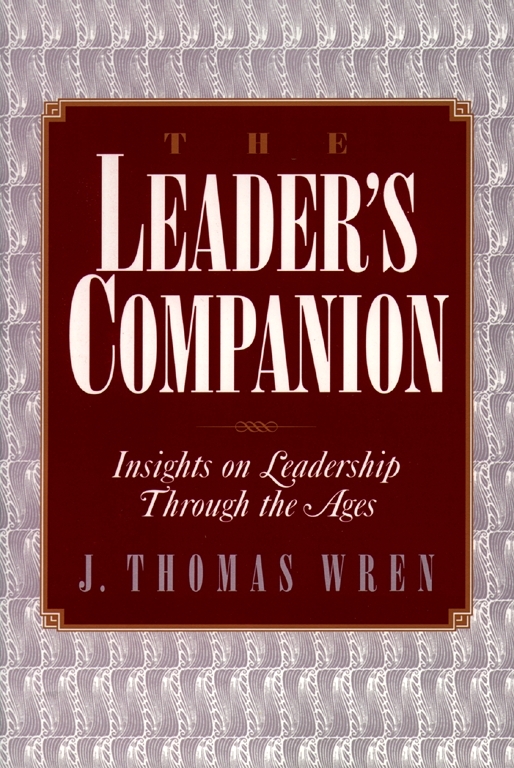 This book serves as a guided introduction to the richly diverse perspectives on leadership throughout the ages and throughout the world. Each of the selections, introduced by the editor, presents enlightening thoughts on a different aspect of leadership. Writings by Plato, Aristotle, Lao-tzu and others demonstrate that the challenges of leadership are as old as civilization. Machiavelli, Tolstoy, Ghandi, and W.E.B. Du Bois provide a wide range of insights into the eternal practice and problems of leadership. Modern masters of leadership such as James MacGregor Burns, John Kotter, and Warren Bennis join such leading practitioners as Max De Pree and Roger B. Smith in discussing contemporary issues in leadership theory and practice. John Gardner has served six presidents of the United States in various leadership capacities. He was Secretary of Health, Education and Welfare, founding chairman of Common Cause, co-founder of the Independent Sector, chairman of the National Coalition, and president of the Carnegie Corporation and Foundation. He is currently the Miriam and Peter Haas Centennial Professor at Stanford Business School. Why do we not have better leadership? The question is asked over and over. We complain, express our disappointment, often our outrage; but no answer emerges. When we ask a question countless times and arrive at no answer, it is possible that we are asking the wrong question -- or that we have misconceived the terms of the query. Another possibility is that it is not a question at all but simply convenient shorthand to express deep and complex anxieties. It would strike most of our contemporaries as old-fashioned to cry out, "What shall we do to be saved?" And it would be time-consuming to express fully our concerns about the social disintegration, the moral disorientation, and the spinning compass needle of our time. So we cry out for leadership. To some extent the conventional views of leadership are shallow, and set us up for endless disappointment. There is an element of wanting to be rescued, of wanting a parental figure who will set all things right. Such fantasies for grown-up children should not lead us to dismiss the need for leaders nor the insistent popular expression of that need. A great many people who are not given to juvenile fantasies want leaders -- leaders who are exemplary, who inspire, who stand for something, who help us set and achieve goals. Unfortunately, in popular thinking on the subject, the mature need and the childlike fantasies interweave. One of [my] tasks...is to untangle them, and to sketch what is realistically possible. Leadership is such a gripping subject that once it is given center stage it draws attention away from everything else. But attention to leadership alone is sterile -- and inappropriate. The larger topic of which leadership is a subtopic is the accomplishment of group purpose, which is furthered not only by effective leaders but also by innovators, entrepreneurs and thinkers; by the availability of resources; by questions of morale and social cohesion; and by much else that I discuss....It is not my purpose to deal with either leadership or its related subjects comprehensively. I hope to illuminate aspects of the subject that may be of use in facing our present dilemmas -- as a society and as a species. We are faced with immensely threatening problems -- terrorism, AIDS, drugs, depletion of the ozone layer, the threat of nuclear conflict, toxic waste, the real possibility of economic disaster. Even moderately informed citizens could extend the list. Yet on none of the items listed does our response acknowledge the manifest urgency of the problem. We give every appearance of sleepwalking through a dangerous passage of history. We see the life-threatening problems, but we do not react. We are anxious but immobilized. I do not find the problems themselves as frightening as the questions they raise concerning our capacity to gather our forces and act. No doubt many of the grave problems that beset us have discoverable, though difficult, solutions. But to mobilize the required resources and to bear what sacrifices are necessary calls for a capacity to focus our energies, a capacity for sustained commitment. Suppose that we can no longer summon our forces to such effort. Suppose that we have lost the capacity to motivate ourselves for arduous exertions in behalf of the group. A discussion of leadership cannot avoid such questions. Could it be that we suppress our awareness of problems -- however ominous -- because we have lost all conviction that we can do anything about them? Effective leaders heighten both motivation and confidence, but when these qualities have been gravely diminished, leaders have a hard time leading. Suppose that fragmentation and divisiveness have proceeded so far in American life that we can no longer lend ourselves to any worthy common purpose. Suppose that our shared values have disintegrated to the point that we believe in nothing strongly enough to work for it as a group. Shared values are the bedrock on which leaders build the edifice of group achievement. No examination of leadership would be complete without attention to the decay and possible regeneration of the value framework. Suppose that our institutions have become so lacking in adaptiveness that they can no longer meet new challenges. All human institutions must renew themselves continuously; therefore, we must explore this process as it bears on leadership. I think of such matters -- motivation, values, social cohesion, renewal -- as the "issues behind the issues," and I shall return to them often in the pages that follow. In this society, leadership is dispersed throughout all segments of the society -- government, business, organized labor, the professions, the minority communities, the universities, social agencies, and so on. Leadership is also dispersed down through the many levels of social functioning, from the loftiest levels of our national life down to the school principal, the local union leader, the shop supervisor. We have always associated both kinds of dispersion with our notions of democracy and pluralism. But as our understanding of the principles of organization has developed, we have come to see that there is really no alternative to such dispersal of leadership if large-scale systems are to retain their vitality. The point is relevant not only for our society as a whole but also for all the organized subsystems (corporations, unions, government agencies, and so forth) that compose it. Most leadership today is an attempt to accomplish purposes through (or in spite of) large, intricately organized systems. There is no possibility that centralized authority can call all the shots in such systems, whether the system is a corporation or a nation. Individuals in all segments and at all levels must be prepared to exercise leaderlike initiative and responsibility, using their local knowledge to solve problems at their level. Vitality at middle and lower levels of leadership can produce greater vitality in the higher levels of leadership. I have seen a good many leaders in action. My first chore for a president was for Eisenhower, whom I had known earlier when he headed Columbia University. Of the seven presidents since then, I have worked with all but two. But I have learned powerful lessons from less lofty leaders -- from a top sergeant in the Marine Corps, from university presidents, corporate chief executive officers, community leaders, bankers, scientists, union leaders, school superintendents, and others. I have led, and have worked in harness with other leaders. The development of more and better leaders is an important objective that receives a good deal of attention in these pages. But this is not a how-to-do-it manual. The first step is not action; the first step is understanding. The first question is how to think about leadership. I have in mind not just political buffs who want more and better leaders on the political scene, nor just CEOs who wonder why there are not more leaders scattered through their huge organizations. I have in mind citizens who do not want to be victimized by their leaders, neighborhood organizations that want to train their future leaders, the young people who dream of leadership, and all kinds of people who just want to comprehend the world around them. Citizens must understand the possibilities and limitations of leadership. We must know how we can strengthen and support good leaders; and we must be able to see through the leaders who are exploiting us, playing on our hatred and prejudice, or taking us down dangerous paths. How many dispersed leaders do we need? When one considers all the towns and city councils, corporations, government agencies, unions, schools and colleges, churches, professions and so on, the number must be high. In order to have a target to think about, and setting precision aside, let us say that it is 1 percent of the population -- 2.4 million men and women who are prepared to take leaderlike action at their levels. How can we ever find that many leaders? Fortunately, the development of leaders is possible on a scale far beyond anything we have ever attempted. As one surveys the subject of leadership, there are depressing aspects but leadership development is not one of them. Although our record to date is unimpressive, the prospects for improvement are excellent. Many dismiss the subject with the confident assertion that "leaders are born not made." Nonsense! Most of what leaders have that enables them to lead is learned. Leadership is not a mysterious activity. It is possible to describe the tasks that leaders perform. And the capacity to perform those tasks is widely distributed in the population. Today, unfortunately, specialization and patterns of professional functioning draw most of our young potential leaders into prestigious and lucrative nonleadership roles. We have barely scratched the surface in our efforts toward leadership development. In the mid-twenty-first century, people will look back on our present practices as primitive. Most men and women go through their lives using no more than a fraction -- usually a rather small fraction -- of the potentialities within them. The reservoir of unused human talent and energy is vast, and learning to tap that reservoir more effectively is one of the exciting tasks ahead for humankind. Among the untapped capabilities are. leadership gifts. For every effectively functioning leader in our society, I would guess that there are five or ten others with the same potential for leadership who have never led or perhaps even considered leading. Why? Perhaps they were drawn off into the byways of specialization...or have never sensed the potentialities within them...or have never understood how much the society needs what they have to give. We can do better. Much, much better.